At the bottom of the post on migrating SimpleSilverlightXpsViewer to Silverlight Beta 2, I hinted at "a cool, practical, relevant use of SimpleSilverlightXpsViewer that I'll be able to share sometime soon". 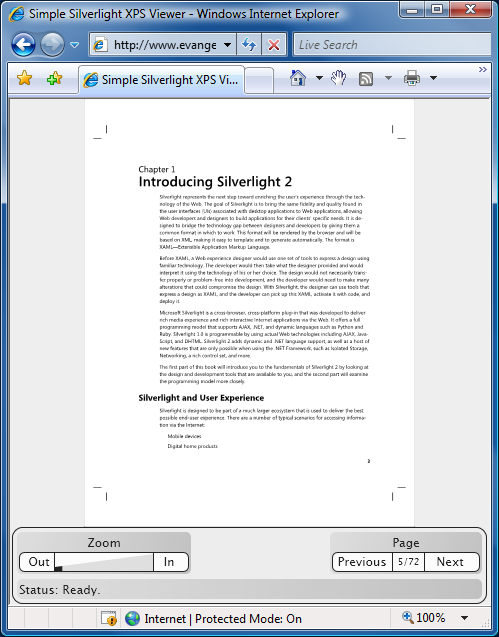 "Soon" is now, and I'm happy to point readers at the "Read about Silverlight in XPS" post by Laurence Moroney in which he uses an adaptation of my viewer for showcasing the first three chapters of his new book, Introducing Microsoft Silverlight 2. In addition to modifying the sample for his purposes, Laurence went further and integrated mouse wheel support: zooming in and out is as easy as spinning the wheel. I've got to agree that it's a very nice usability improvement! The version number of SilverlightDefaultStyleBrowser always appears in the window's title and the latest release number is 1.0.3123.31689. (Note: I haven't updated the screen shot below which shows the introductory version number.) If installed via ClickOnce, the application should automatically prompt you to upgrade once it detects the update (which typically happens after running the app once or twice). If you're using the standalone EXE, you'll need to update manually. Click here or on the image above to install SilverlightDefaultStyleBrowser via ClickOnce with automatic updating. Click here to download the standalone SilverlightDefaultStyleBrowser executable and source code in a ZIP file. On most machines it seems that the upgrade to Silverlight version 2.0.30523.8 automatically uninstalled the bits for 2.0.30523.6. However, on some machines (like one of mine! ), the uninstall of 2.0.30523.6 was skipped or incomplete. So it's possible that SilverlightDefaultStyleBrowser's new behavior of importing from all directories under %ProgramFiles%\Microsoft Silverlight will import Styles from more than one version of Silverlight. To help avoid confusion - and to support multiple side-by-side installations of Silverlight in the future - I've modified the ToolTip for the ListBox items to display the path of the assembly from which that Style came. So if you see multiple Button Styles in the list, just hover over each of them to see where they came from - then pick the one that matters to you! I've tweaked the ListBox item ToolTip to pop up when the mouse is over any part of the item (instead of just the Style's name). This was a simple matter of adding HorizontalContentAlignment=Stretch to the ListBoxItems via the ListBox's ItemContainerStyle property. I'm sorry for any trouble the recent Silverlight upgrade may have caused! The good news is that this particular problem shouldn't happen again. :) And if it does, you can always use the "Add Assembly" button to manually import Styles from any file(s) you want until I get around to fixing things. XAP files are really just standard ZIP files with a different extension, so we can use ZIP-file tools to improve the XAP situation quite easily. I wrote a simple batch file named XapReZip.cmd (contents below) that can be added to a Visual Studio 2008 Silverlight project to automatically re-compress the project's XAP file more efficiently. 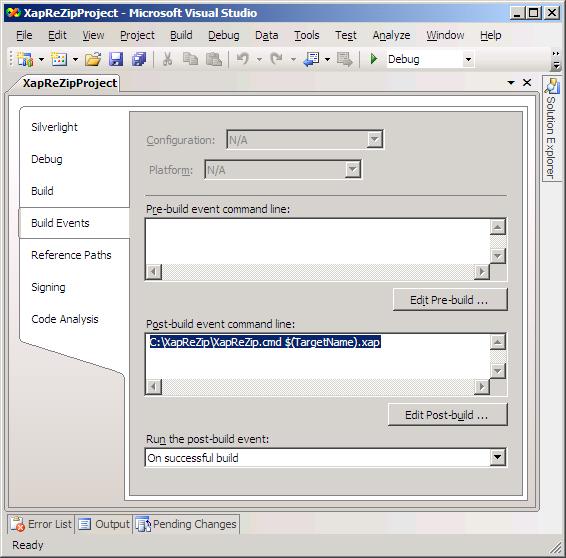 All you need to do is add a single command to your project's post-build events (detailed below) and from then on all your XAP files will be even smaller and quicker to download! The complete code for XapReZip.cmd is below. As written, XapReZip assumes that Zip.exe and UnZip.exe will be located in the same directory as XapReZip.cmd (this is easy to change) and that all of the files that are part of the XAP are available in the same directory as the XAP file itself (which just happens to be true after compiling with Visual Studio or MSBuild). For the purposes of this demonstration, I've used Zip 2.32 and UnZip 5.52 from the Info-ZIP group because they're free and have a nice license. Of course, you can use whatever tools you're most comfortable with. So if you're eager to keep your Silverlight applications as lean as possible, consider adding XapReZip to your project. It'll probably be the easiest 22% savings you get all day! In the introductory post for LayoutTransformControl, I showed a trivial use case to demonstrate the need for LayoutTransform in some scenarios. I also noted that Silverlight 2 supports only RenderTransform, but went on to demonstrate how it was possible to use RenderTransform to get LayoutTransform behavior. I described how my LayoutTransformControl sample did just that, but implemented only RotateTransform functionality for its initial release. My impression then - as now - is that rotation is easily the most common use of LayoutTransform. However, there are plenty of scenarios where the other Transform subclasses (scale, skew, matrix, etc.) are required, and I wanted to have a solution for them as well. LayoutTransformControl should now be just as powerful as WPF's LayoutTransform is. Your application can take advantage of complete LayoutTransform functionality today - even though the Silverlight platform still doesn't officially support LayoutTransform! 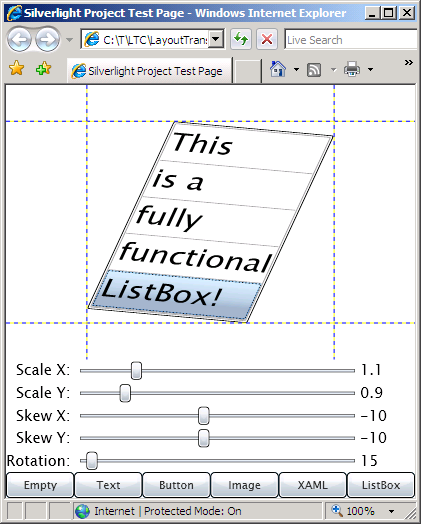 Improvements to Silverlight in Beta 2 (vs. Beta 1) meant that I was able to remove the lesser of the two Silverlight-specific workarounds present in the Beta 1 code. In WPF, changes to the members of a Transform property (be it an individual Transform or a TransformGroup) automatically cause the Transform property's property changed handler to be invoked (even though OldValue==NewValue). This is a wonderfully elegant way to handle the situation - and unfortunately this behavior isn't present on Silverlight. So LayoutTransformControl needs a way to know when one of its Transform members has been updated and it can't rely on Silverlight to tell it. One solution is to try to create a Binding to the relevant properties of each of the members. Unfortunately, Bindings don't work on Transform-derived classes in Silverlight (my theory: because Transform derives from DependencyObject instead of FrameworkElement where the SetBinding method is implemented). So what I've done is create a set of "Ltc"-prefixed Transform-derived classes that do provide automatic notifications (but still not Binding support - due to the same Silverlight limitation, I suspect). So instead of RotateTransform, you use LtcRotateTransform and get change notifications for free. The "Ltc" Transforms have the same transformation properties (ex: Angle, ScaleX) as their counterparts, so they're simple, plug-compatible replacements - with two caveats: LtcTranslateTransform doesn't exist (because TranslateTransform has no effect during LayoutTransform), and the CenterX/CenterY properties aren't implemented (for the same reason). The "Ltc" Transforms are a pretty good workaround, but you don't have to use them. If the members of the LayoutTransformControl's Transform property never change, then change notification is unnecessary and the standard Transforms can be used without issue. The code in the "Motivation" project (part of the attached solution) demonstrates this approach. If the members of the Transform property do change and you're able to use the "Ltc" transforms, then the right thing should happen automatically. The code in the "Sample" project demonstrates this approach. But if your scenario is such that the members of the Transform property do change and you're unable to use the "Ltc" Transforms, all is not lost! LayoutTransformControl exposes a public TransformUpdated method that you can call to notify it of changes to the members of its Transform property. The code for the test matrix projects uses this last approach. My goal with LayoutTransformControl has always been to address a perceived need. It began life as a bit of an experiment, but by now I've become rather fond of the solution and plan to incorporate it into projects of my own. 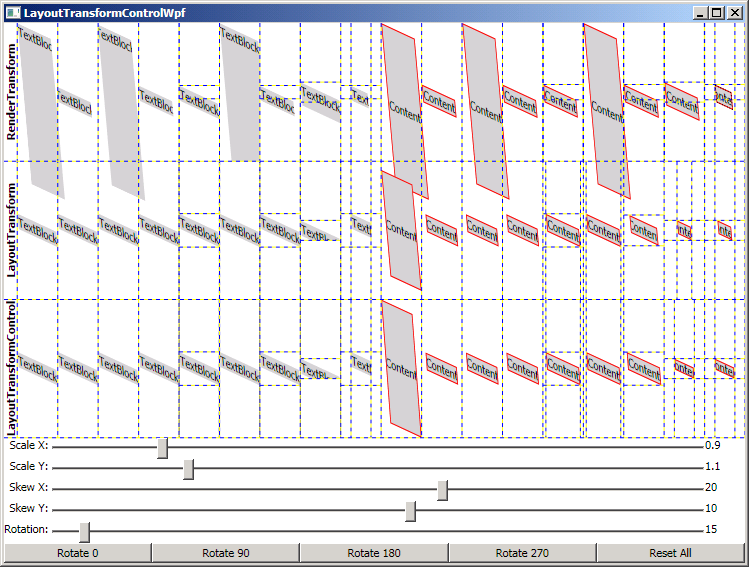 I hope that if you have a need for LayoutTransform behavior in Silverlight, you'll consider LayoutTransformControl, too!